Newvita Natal Plus 60 tablets order online. 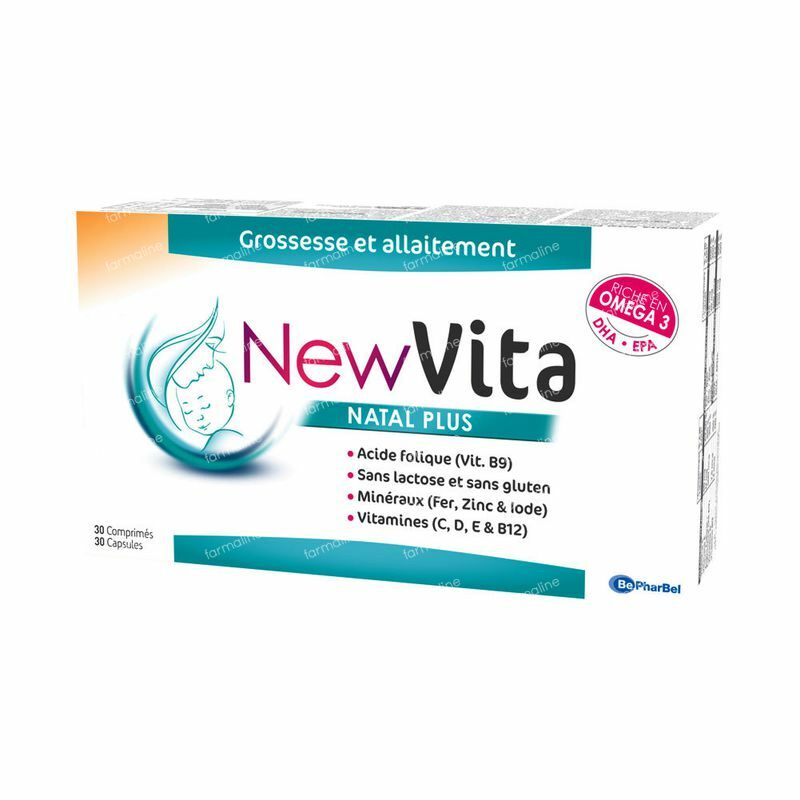 NEWVITA Natal Plus is a multivitamin food supplement whose unique formulation is rich in folic acid (vitamin B9 or vitamin M), essential trace elements for pregnant women and Omega 3 fatty acids (DHA, EPA). 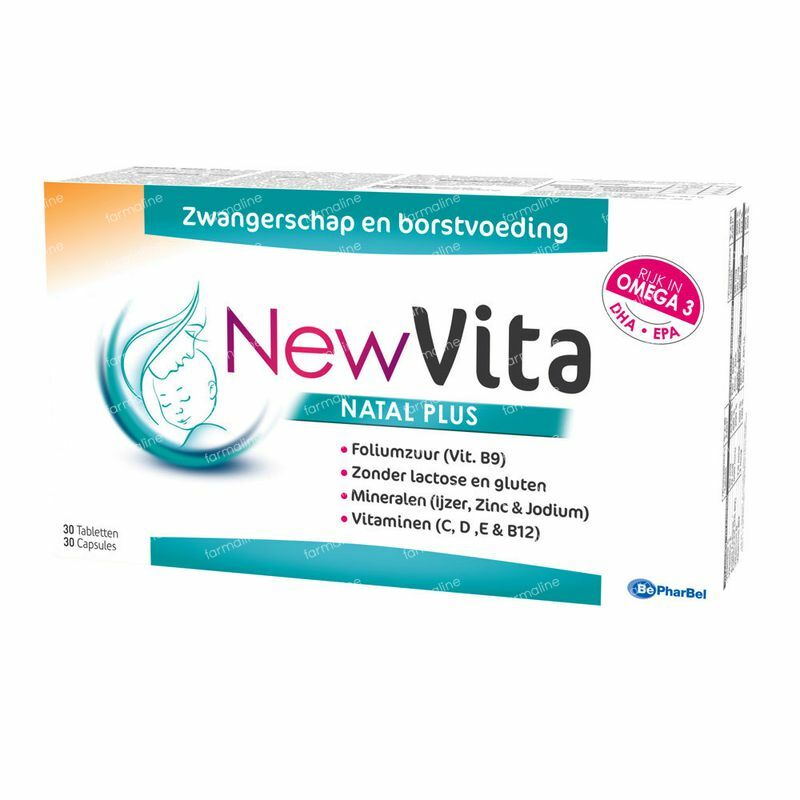 NEWVITA Natal Plus helps to make up for dietary deficiencies in women who are pregnant or breastfeeding, even if their diet is varied and balanced. Indeed, the mother and child need additional supplements during pregnancy and breastfeeding. NEWVITA Natal Plus is specifically formulated: it does not contain lactose and is therefore suitable for people who are lactose-intolerant. Furthermore, the fact that NEWVITA Natal Plus does not contain lactose helps to maintain the folic acid in ideal conditions of stability. 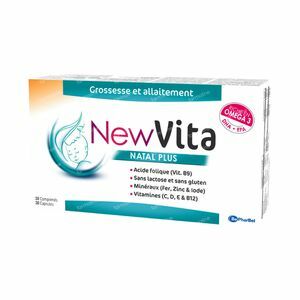 The formulation of NEWVITA Natal Plus is a unique formula on the market which provides 100% of the recommended daily allowance in Omega 3 fatty acids for adults, to deliver the beneficial effects of EPA and DHA to pregnant and breastfeeding women. It should not be used as a replacement for a varied and balanced diet and a healthy lifestyle. Folic acid plays a very important role in cell division. As such, it contributes to good growth and development of the baby. It also contributes to the formation of the placenta. It is important for a woman wishing to have a child to build up a reserve of folic acid from the moment pregnancy is desired, but also throughout the pregnancy. Such reserves of folic acid may have been diminished through taking a contraceptive pill for a period of several years. Iodine is an essential element for the correct functioning of the foetus’s nervous system. It contributes to the development of thyroid hormones. Our food intake contains iodine, but often in insufficient quantities. Iron plays an important role in the normal formation of red blood cells and haemoglobin, as well as in the normal transport of oxygen through the body. A sufficient intake of iron helps to reduce tiredness frequently observed during pregnancy and breastfeeding. Zinc plays a role in the cell division process, in synergy with folic acid and helps the immune system to defend the body. It contributes to normal fertility and healthy hair as well as finger nails and toe nails. Vitamin C contributes to the assimilation of iron by the body, as well as healthy immune function. It protects cells against oxidative stress. Vitamin D plays a role in the absorption of calcium by the body and participates in development of the foetus’s bone structure. It helps to maintain the bone mass of the mother because the demands to which it is subjected are increased during pregnancy. It intervenes in cell rejuvenation mechanisms. Vitamin E contributes to protecting cells and tissue against oxidative stress. Vitamin B12 enables better absorption of folic acid and the normal formation of red blood cells. It is an essential vitamin for a healthily functioning brain and nervous system. It intervenes in the cell division process and the gen- eration of energy. NEWVITA Natal Plus contains a combination of DHA (docasahexanoic acid) and EPA (eicosapentaenoic acid) polyunsaturated Omega-3 fatty acids, which play a significant role in the development in the eyes and brain of the foetus as well as a child being breastfed. These essential fatty acids participate in the structure of cellular membranes and the balance of the body’s physiological responses. They also contribute to a healthy heart. DHA also has a beneficial role during periods of mood swings in the mother after the birth. A daily intake of these fatty acids helps to avoid drawing them from the pregnant or breastfeed- ing mother’s reserves. EPA plays a vital role in increasing the fluidity of the blood, in attenuating inflammatory responses and in emotional balance. throughout pregnancy; during breastfeeding; for use against any temporary tiredness; for use against mood swings just after the birth. 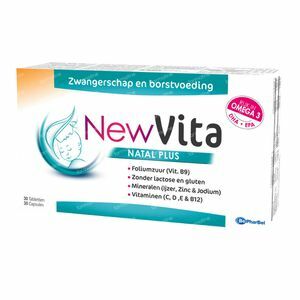 NEWVITA Natal Plus is made up of a tablet of vitamins and trace elements and a soft capsule of fatty acids. It is recommended to take one tablet and one soft capsule per day with water, preferably during the midday meal. NEWVITA Natal Plus should not replace a balanced and varied diet. It is simply an essential supplement to your daily diet. NEWVITA Natal Plus contains 200mg of DDHA as well as 250mg of EPA/DHA from highly purified and concentrated fish oil. Ascorbic acid, Ferrous fumarete, Zinc sulphate, Alpha tocopherol, Fo- lic acid, Potassium iodide, Cholecalciferol, Cyanocobalamin - Bulking agents : Microcrystalline cellulose (E460), Croscarmellose (E468), Colloidal silica (E551) – Coating agents: Talc (E553b), Hydrogenated cotton seed oil, Magnesium stearate (E470b), Titanium dioxide, Stearic acid, Microcrystalline cellulose, Carmines. Modified and refined fish oil (DHA, EPA/DHA), fish gelatine, glycerol. This product does not contain gelatine of bovine product does not contain gluten or lactose. Store at room temperature, between 15°C and 25°C in a dry place or away from sources of moisture.